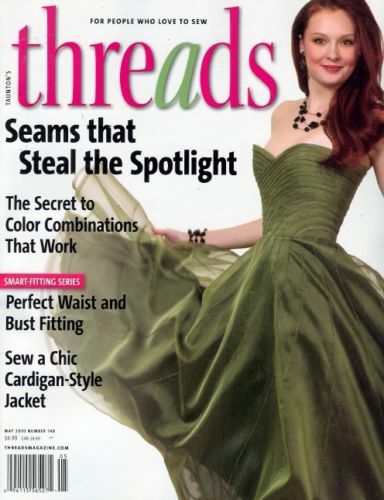 I was not a big fan of Threads — the issue I got a while back (for free) had some coats and projects that looked really… home-made. However, this issue’s cover dress looks gorgeous! I wish I could find a clearer picture to show you, but the bodice has really intricate seam lines, and the skirt is fun and flowy with lots of seam as well. I flipped the magazine open, and took a look at the how to. It is basically lots of bias strip of fabric sewn onto the bodice! I do have a corset that I never wear anymore, and it could be a really good base for this dress. I am tempted to make it! It could be very cute as a pretty formal but fun dress. However, it looks like it will take FOREVER to do. Maybe after my wedding (though its a great idea for a fun wedding dress too)! Do you guys like it? Have you ever done something like this? This entry was posted on Tuesday, March 30th, 2010 at 8:18 pm	and tagged with inspiration, seams and posted in sewing. You can follow any responses to this entry through the RSS 2.0 feed. Ooo.. that would be a pretty wedding dress, but does looks like a lot of work. That bodice is gorgeous- I’d say it’s definitely worth the effort. It’s detailed without being overwhelming. Go for it! I’m way behind on commenting on this post, but this dress is wonderful! I just found your blog and I love it!